The MANDRAKE (Kryptek) Camouflage Pattern was created by Kryptek Outdoor Group by developing an innovative transitional pattern concept technology. Composed of two levels, this camouflage pattern includes sharp geometrical patterns inspired by Foliage, Animal, Marine & Geographic visual features layered over a transitional shading background which creates a three dimensional effect providing concealment at both close and long range. The Multi-Directional Design of the pattern provide a great capacity of adaptation in a multitude of terrains and landscapes that have either Vertical or Lateral Flow. The Mandrake pattern is primarly designed for heavily wooded areas & shadowy forests and use colour schemes that blend with natural surroundings (Browns, Greens, Beiges & Greys). 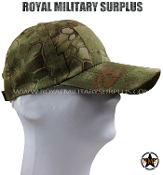 Currently in use by Military Personnel, Special Operations Forces and Hunters all around the World. 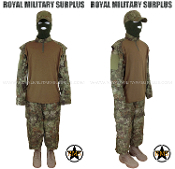 The Canada based Royal Military Surplus online store offers range of quality Military Kits, Combat Uniforms, Tactical Gear and Military Apparel in MANDRAKE (Kryptek) Disruptive Camouflage Pattern.